I thought taking the time to answer this in a more in-depth manner, would serve as a good resource for me to be able to send people to, for further reading. So… Just What is Cold Email? Cold email is an email sent to a potential customer that has had no prior relationship with you. You can think of it like a cold call, but much less obtrusive. A successful cold email outreach plan uses personalised cold emails to make contact with those potential customers that you’ve had no prior relationship or connect with. There is a difference between bulk pharmacy product emails (which accounts for 81% of spam) and one-to-one emails to a targeted business audience. Under the CAN-SPAM act, you are able to send emails to business people that you do not know. However, you want to make sure you are complying with the rules. Don’t misrepresent who you are – Basically, your “From”, “To”, and “Reply-To” information needs to identify who you are. Identify if the email is an ad – If your email is an advertisement or special coupon offer, just make sure it is labeled as such. Give them an opt-out option – You don’t have to use an “unsubscribe” link which takes away some of the personal aspects of the email. Instead, ask them, “Please let me know if you are not the right person to contact for this.” It’s a good alternative that keeps things personal. Honor opt-outs – If they don’t want any future emails, make sure they don’t get any more emails. I don’t even respond to the request, I just make sure they don’t get any more follow-ups. Know what others do/send on your behalf – Even if you hire a company to handle your email outreach, you are still legally responsible. 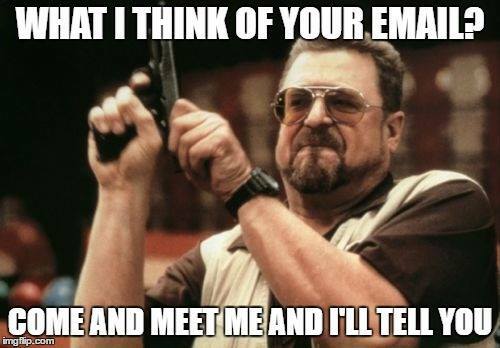 Make sure whoever you have working on your email outreach understands these seven rules. Is cold email outreach unsolicited? Yes. Is cold email SPAM? No. Not if you follow the rules outlined above. How do your customers view the problem you are trying to solve? Have your message meet them where they are at, and help them solve a legitimate problem. People can sniff out “marketing copy” right away. Write your message like something you would send to a co-worker, not giving a speech to 1,000 people. When someone views your message on their mobile device, and the first line reads, “I’m Mike with ABC Corporation,” you make it very easy for your prospect to delete the message and not read any further, especially if you hit them on a busy day. You have a very short window to get your prospects attention. Lead with your most compelling piece of info, and make it good! If your message is a burden for your prospect to read and/or respond to, they won’t. So keep it short and simple. If you can, adding your prospects first name is good, but not essential. Especially if you can jump right into a conversation they are excited to talk about. Make it easy for your prospect to do a little detective work by architecting your signature to include the links you want them to see. Be subtle about this, less is more in many cases. Images can hurt deliverability, and may be better served on a landing page after your prospect clicks your link. You can use the P.S. to satisfy the opt-out requirement, keeping the message conversational rather than having the obnoxious opt-out link. Asking a quick question can be a great way to entice your prospect into a conversation with you. A great way to begin the relationship building phase towards the sale! Follow Up, then Follow Up Again! If your prospect doesn’t reply to your initial message, go ahead and follow up. They may still be interested when they have more time to respond! Try different hooks in each of your messages. Try giving them more or less details, and try different links and educational resources. Don’t ever quit! It can be a numbers game on some level, and a dedicated commitment to sales prospecting can bear a lot of fruit over time! Obviously, using cold email outreach is a method to generate leads and interest in your product/service. There are other ways you can use cold email outreach as well. In today’s lean startup approach, it’s more important than ever to talk to your potential customers before you start going crazy with development and business plans. I would gather up a list of people in a target market and shoot them an email to determine what, if any, pain points they have. I’d look for common responses and then do research based on that feedback. Or if I have the idea already, I would just direct them to a landing page to see what kind of interest there was. Another way to leverage cold email outreach is to gather feedback on surveys or to ask questions. Let them know you’re performing research and planning to publish the results of the poll/questions/feedback in a future blog post on your blog. This is a very soft way of sending people to your website without directly asking for a sale. You might want to invite prospective customers to a webinar or a networking event (if they’re local). Cold email outreach is a great way to increase attendees with prospective customers. One of the best ways to scale your sales is to automate your outbound lead generation. Identifying key target accounts and then using cold email can be a great way to generate conversations. Is cold email spam? NO! Cold email outreach is a great method for generating leads as well as validating future business ventures. P.S. Any other advice you’d recommend for cold email? This entry was posted in Blog on June 21, 2017 by Simon Test.